A journey always feels more epic when it starts with crashes of thunder, and that adrenaline burst that accompanies the arrival of a storm. 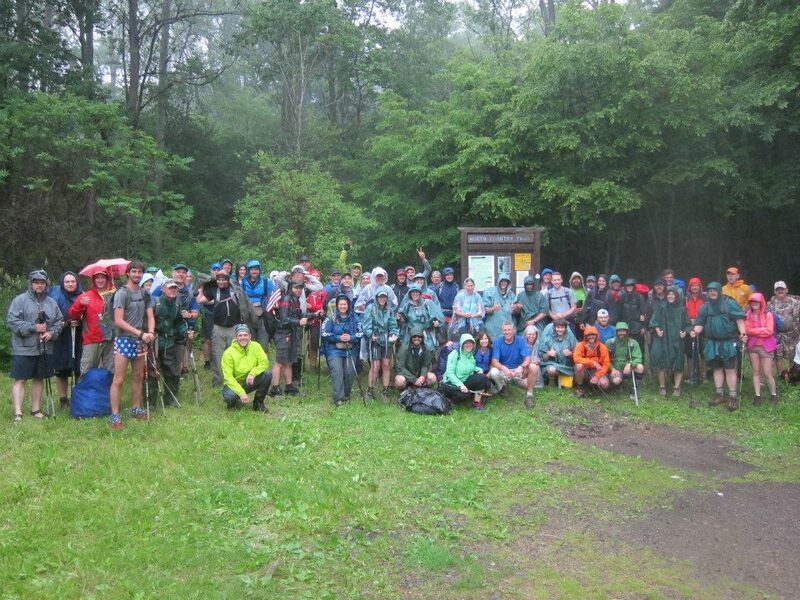 The Allegheny 100 Hiking Challenge (or A100 as those of us involved like to call it) is a point to point unsupported hiking event that happens in early June each year. 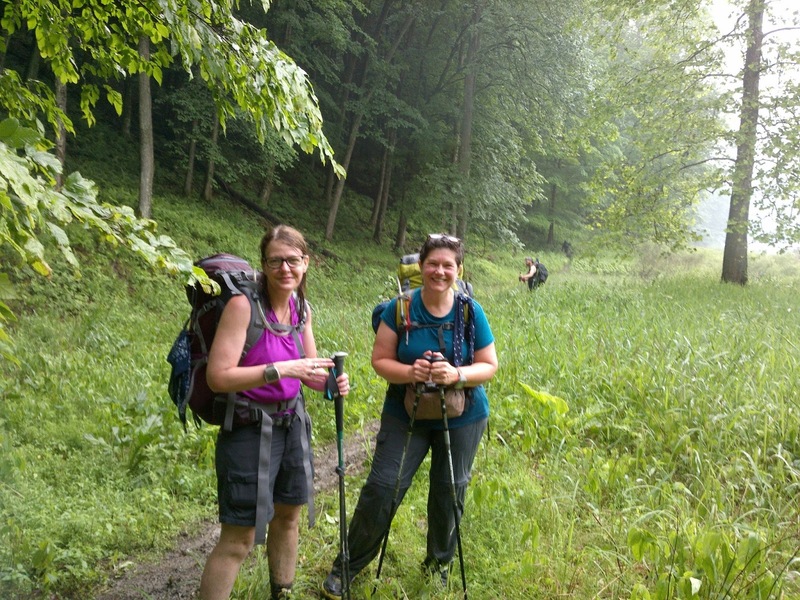 Though every two years it changes directions, this year we hiked north to south on the 100 mile portion of the North Country Scenic Trail that goes through the Allegheny National Forest. The challenge starts Friday evening at 6pm, and finishes Sunday at 8pm. Group photo right before the sky really opened up. Myself and my good hiking buddies. Now for those of you who are Ultra-runners, you know unsupported means, you have to carry all of your own stuff. So we did. I've known for a year that I was going to do the challenge again this year after taking a hiatus from it last year to run The Highlands Sky 40 mile ultra. I had done the challenge in 2013, and I still believe it was the best mental and physical training session I had to for the 100 mile ultra I ran that same year. My hiking buddies not long after the start. So this year it was back to it. I have been gathering solo-hiking/camping gear for the past couple of years, and this year I decided last minute that I needed a few more things to be comfy. 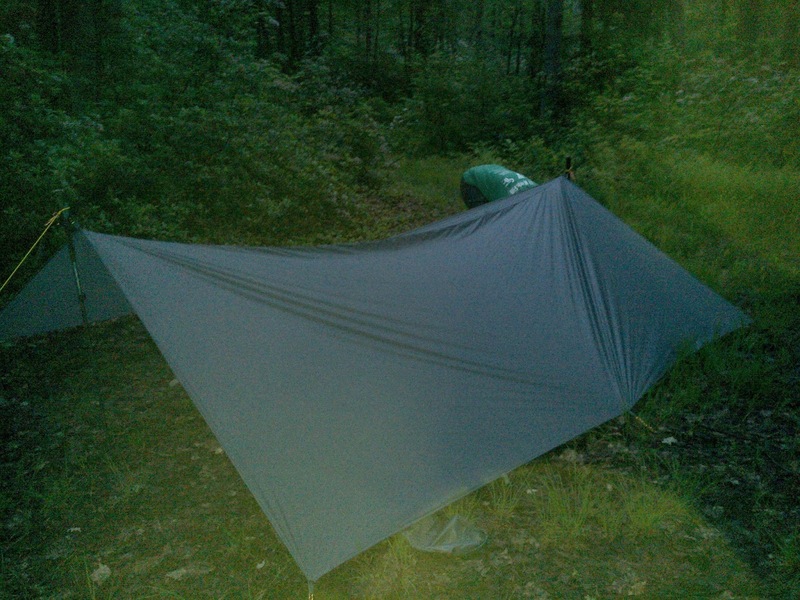 I got a solo rain proof bivy (a tiny one person tent, really), a silk sleeping bag liner to use as my sleeping bag, since the temperatures would be warmer this year. I also bought a ton of food. I remembered not carrying enough food the first year, so this year I wanted to be prepared. So Thursday night, I packed and repacked 3 or 4 times. First, I wasn't happy with how things were fitting, so I changed packs. Then I realized the orange pack was too big, so back to the red one. 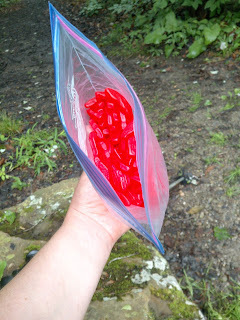 Then I had too much food, so I split everything up into more baggies, and repacked the red bag again. Then I went back through one LAST time and took only the things I needed to survive. This meant eliminating a tiny flashlight (I had my headlamp), a hairbrush (who cares about hair in the woods), and the extra bag of Swedish red fish (they would wait at my resupply in the car). Thing was, me and my hiking partners, Kim and Alisha, weren't quite sure how far we were going to make it this year. The first year, we had all made it 50 miles, and last year, Kim and Alisha had managed 50 as well. This year we were shooting for 75 and had also arranged to keep going Monday to try to reach 100 miles if we had the feet for it still. So I stashed a bunch of extra supplies in my car so that if my food-stuffs were depleted by 75 miles, I could grab some stuff to continue on. Seventy-five miles was the goal. So after some car parking and juggling to get cars to as many access points as we thought we would need (one at the 100 mile finish, one at the official 75 mile finish, and one about 6 miles before the 75 mile finish), we were at the location to catch the bus to the start. The bus ride was fun, as we chatted with fellow hikers who were doing the challenge. There were about 100 people in total that were starting the challenge. We pulled up to the Willow Bay trail head parking area, and we could see a dark cloud to the west moving steadily closer. We got off the bus, registered, then pulled our rain gear and pack covers on. The organizers made a very brief announcement (the thunder was rumbling closer), then as the rain started, he shooed the 100 milers onto the trail, then everyone else just clumped across the road, climbed the guard-rail, and we were off, with a nice rain shower and rumblings of thunder sending us on our way nearly an hour before we were officially scheduled to start. Five p.m. on Friday, and we sloshed into the Allegheny National forest, only about a mile south of the New York state line. 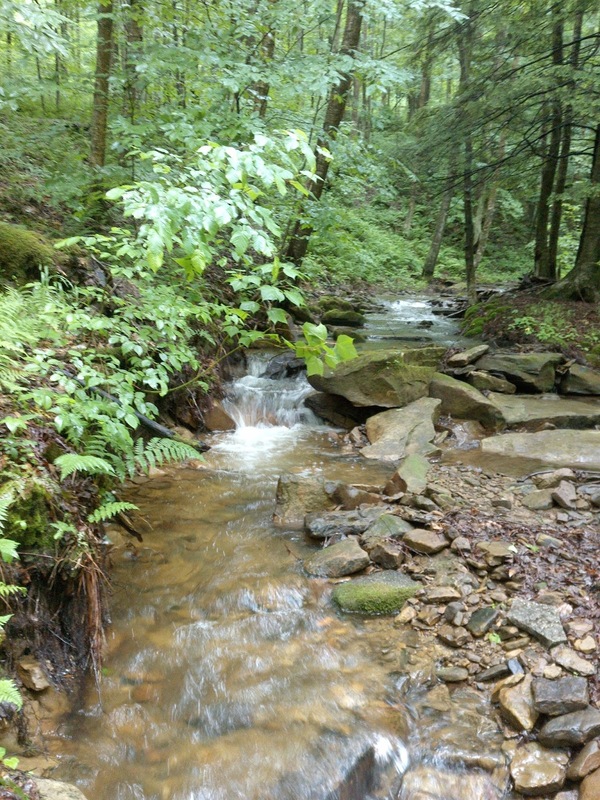 Inlet at Tracy Run and North Branch streams. It had finished raining and everything was very calm. Now before I get into the grit of the story, the ups the downs, the endless slogs through mud and many splashes through streams and run-offs, whether we survived (spoliers, we did), I want to go a little into what I had packed this year using what I learned from the first year. I won't get into it it in excruciating detail, but if you want to know more, please email me! This year, my feet and food were my main priority. 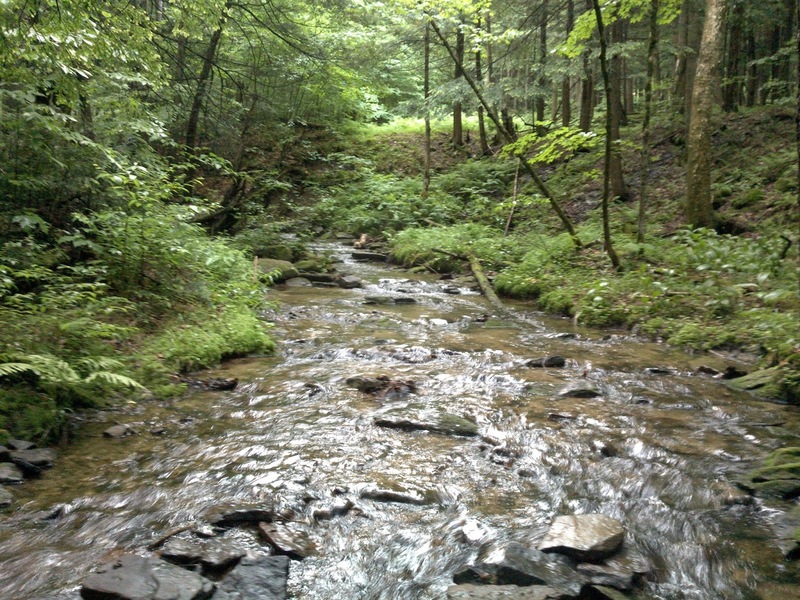 There is no lack of fairly clean water in the forest, and this year the couple weeks leading up had been pretty wet, so all the streams were flowing nicely, and I took my steri pen and a pretty open mouthed .5 bottle to treat it before I poured it into my 2 liter hydration bladder. This system worked fairly well, and we stopped a couple times a day to treat water and fill our bottles. Stopping for water also gave me an opportunity to clean out shoes and socks (downstream from where water filling was happening - don't worry). The mud and grit would collect in shoes and socks, making a gritty, cakey, toe-blistering haven. So when we took a break, the shoes and socks came off and were rinsed out very completely. I also had brought baby powder in a plastic bag, which I applied to my feet liberally before we slept each night. Then in the morning before I put dry socks on (I had brought several pair of thin toe socks), I slathered my toes with Aquaphor. I have to say, I had only one tiny blister when I was done, and my feet felt great. The inlet leading from Johnnycake Run. We stopped for a food break here. So we were as prepared as we thought we could be, and were on our way. The rain wasn't terrible, though I was glad to have my poncho and a hat on for the first hour. The mud was slick. There was no avoiding it, and the worst places were not where it was totally mucky, but where the trail was still mostly solid, but where there was a cant to the right or left or down where you would most likely slip off the trail if you weren't extremely careful. Alisha and I both took some spills. I fell on my knee on the second mile, and first blood was had by the trail. It wasn't bad, just a long scrape. I sloshed it of in the next creek, and we were on our way. 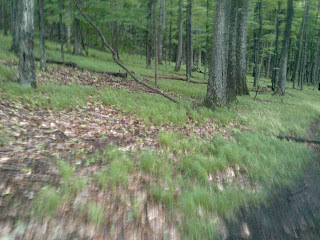 The forest was beautiful, if muddy. Getting ready to move on from on of our first breaks. A decent climb followed. 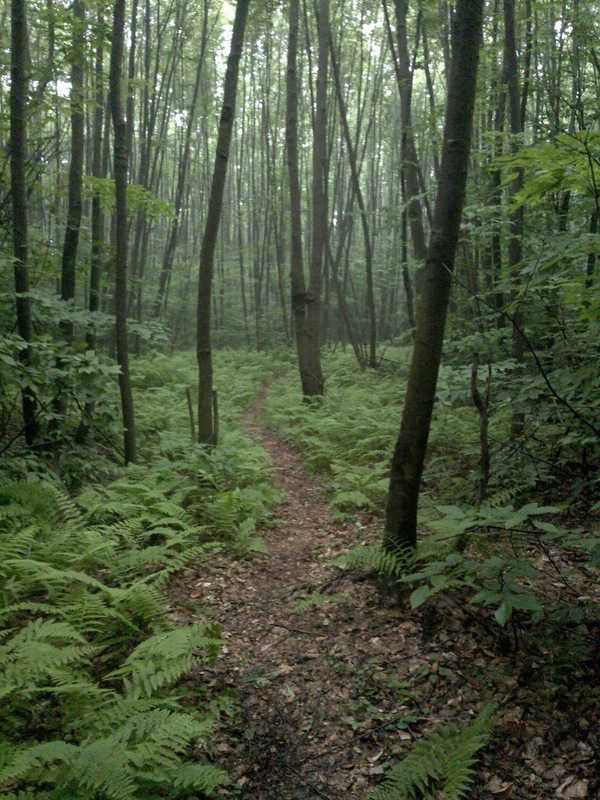 The trail is challenging. There were some pretty good climbs that first evening. As we were rolling into dusk, we left most of the muddiest portions and climbed up onto the ridge line. I admit, I got a little homesick at this part, missing my family and my pups. 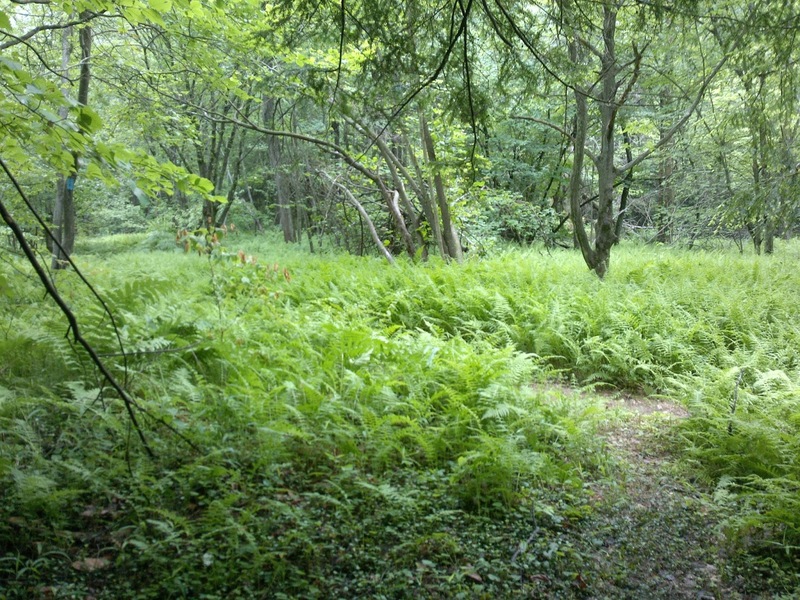 I had walked this portion with my older dog, Zoe a few times in the past couple of years, and I knew she wouldn't have done well on such a muddy long adventure. I missed her here though. Up on the ridge, the trail was much nicer. We started down from the ridge in a long descent that would bring us out on the road briefly to cross a bridge. 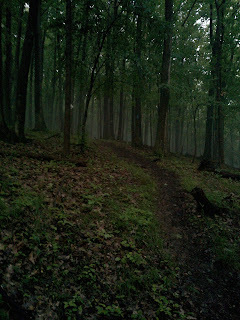 As it got darker, we saw other hiker's headlights in front of us, and lots of toads on the trail. We must've seen more than a dozen of the little guys, and yes, I said hi to them all, but I just nudged them off the trail with my toe, or herded them off with my hiking pole. 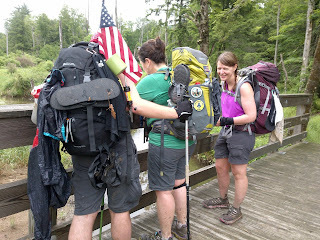 Our group of three had be joined by a friend of ours, Rob, and a new friend, Ashley, a hiker gent from West Virginia. 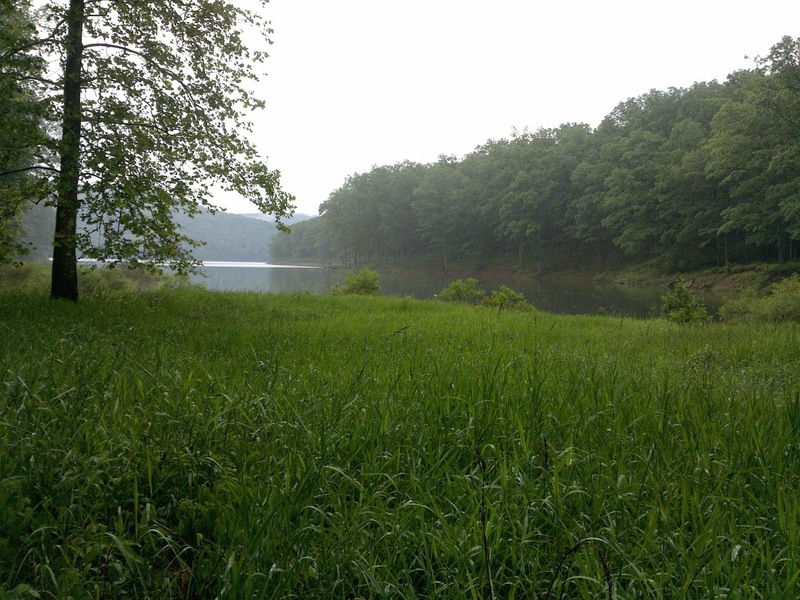 We spent the next few miles wandering along the edge of the Kinzua Reservoir. We heard people whooping and hollering across the lake, so we whooped to them. 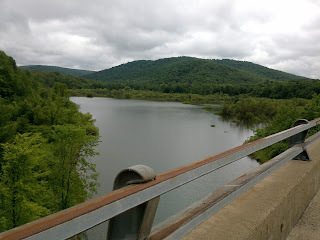 We saw people fishing along the edges with glow in the dark bobbers, and then, as we came out onto the road for a little even walking, we saw the lightning bugs. Synchronous fireflies. I had only learned about them a few weeks ago, and here they were along the edges of some weedy wetlands in the Allegheny National forest. They all light up at the same time, and seeing it, was magical. I grew up catching lightning bugs in Pittsburgh at my Grandma Hrach's house, in old margarine containers with holes punched in them. At the end of a good night's catch, I'd just leave the container open and outside so they could all go free again. 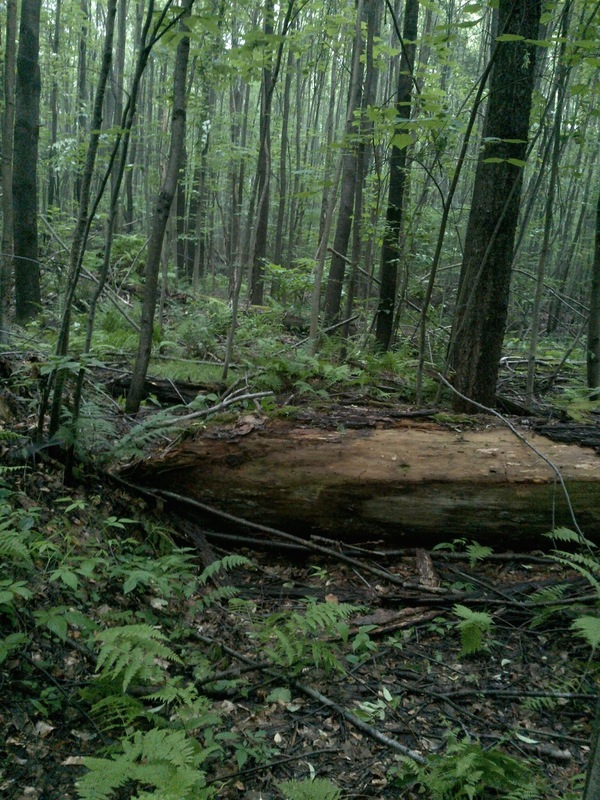 The fireflies along Kinzua were amazing. We didn't really stop, but for a good mile they kept up their light show. 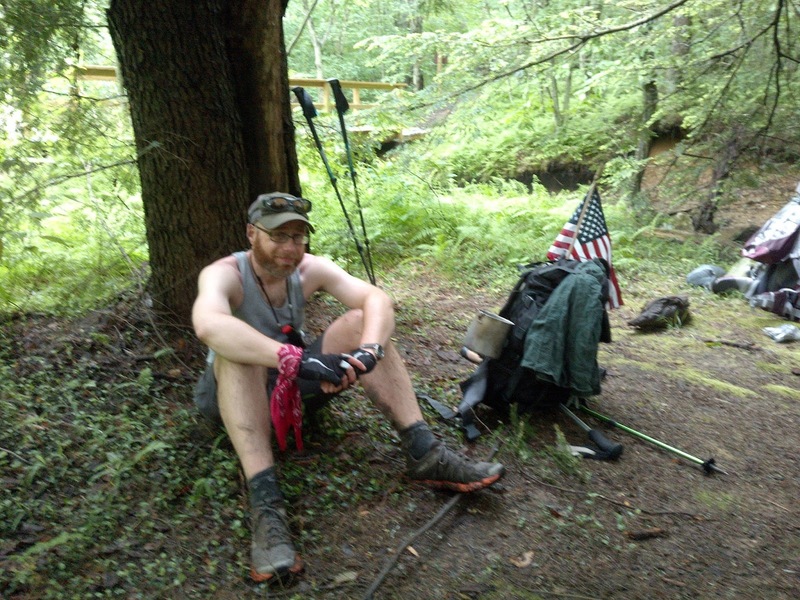 After that, our friend Ashley stayed behind, wanting a break, and we pressed on, starting a long climb that would lead us to Route 59. 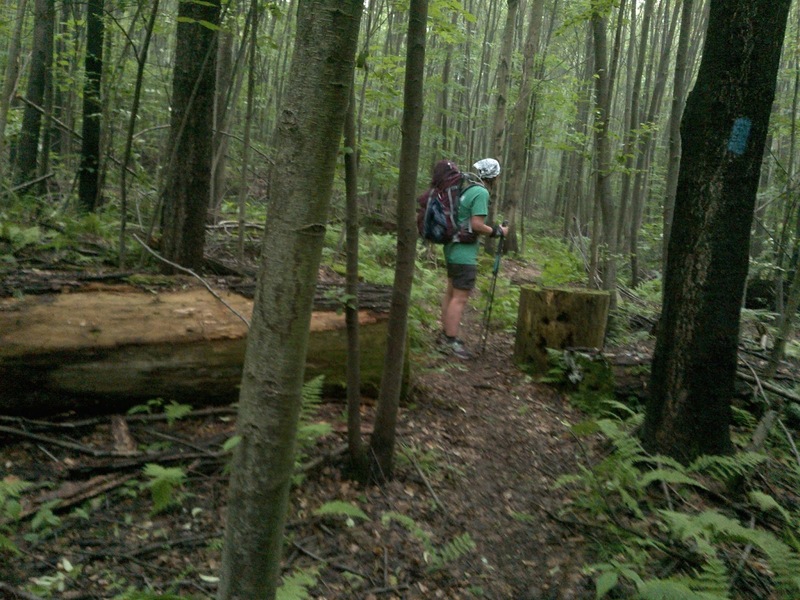 We planned to hike until around 1 am and then grab a few hours of sleep, wake at 5, and get back on the trail by 6. 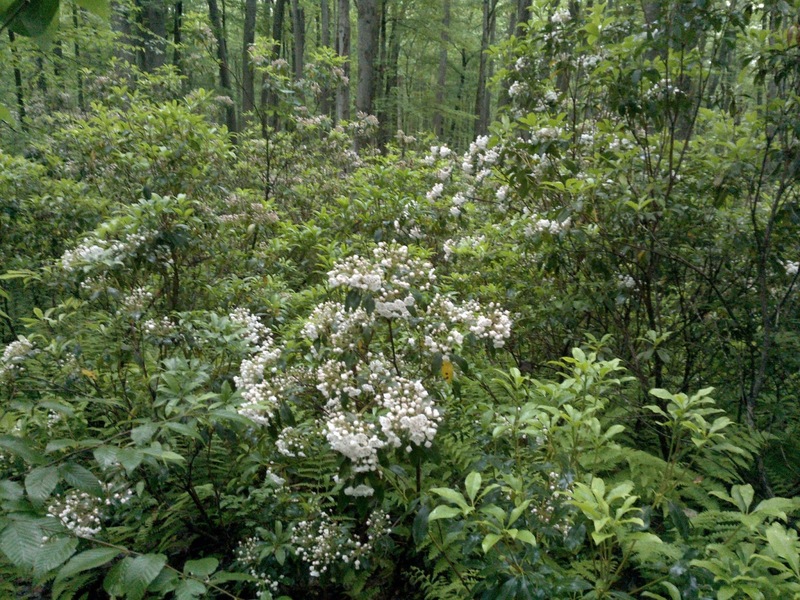 After some challenging climbs, some thick fog, and some grown up areas where I clanked my poles together, just in case there were bears, we came upon this beautiful area of blooming mountain laurels (even at 12:30 at night). The hills leveled out onto a double tracks with some clearings on the side, so we picked one and made our first night camp. First night's camp set up. 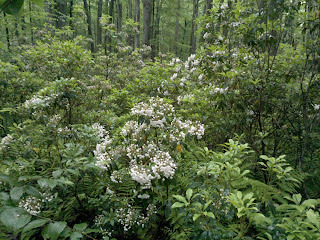 The mountain laurel were amazing. 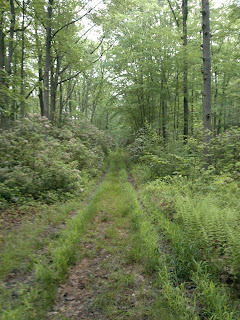 The double track with mountain laurel on each side. 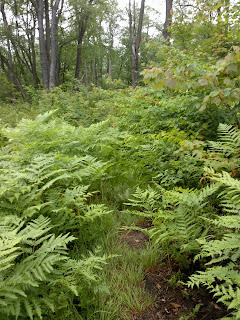 As we continued and crossed 59, the terrain changed to a fern and peat moss covered area. 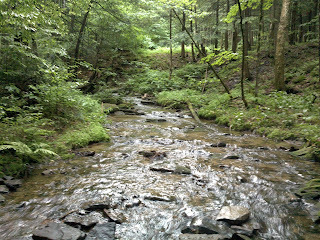 There was a small stream we stopped at in the morning to refill our bottles at, and it was crystal clear. We followed it through the morning, and eventually it became a very wide stream. Though we had camped, none of us had rested very well. I'm pretty sure I didn't sleep. I may have dozed, but I was too wired from the night's excitement. 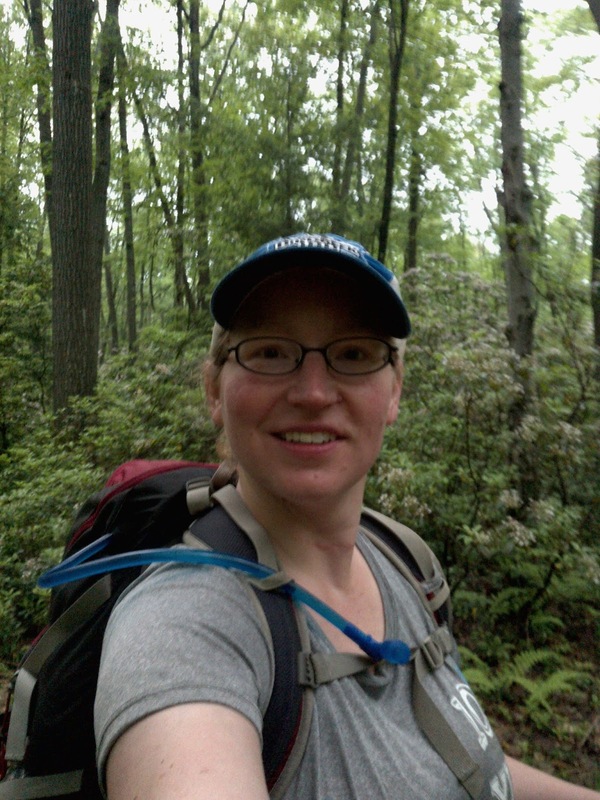 It hadn't rained since that first hour on the trail, but was overcast, so the hiking temperatures were perfect. 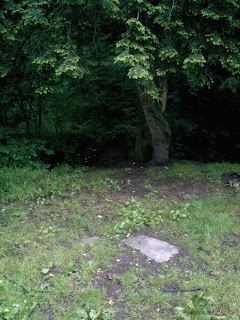 As the morning wore on, I stumbled here and there as I got sleepier. I had brought a couple of flat cokes, an though I had drank one in the morning, the lack of caffeine was showing. 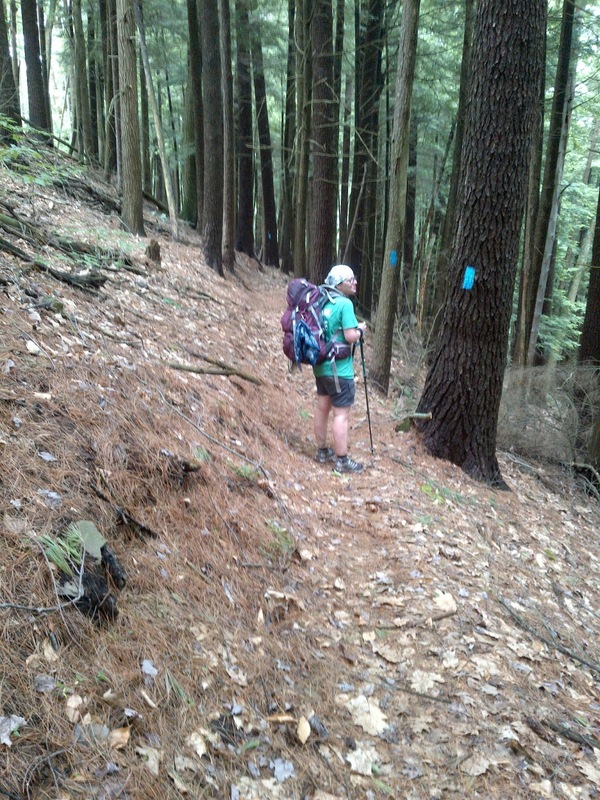 My other big problem for Saturday, was my left shoulder was radiating pain from carrying a 20+ pound pack. 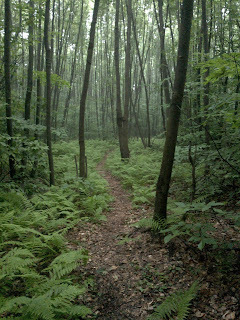 I got to a point where I was lagging behind, and carrying my trekking poles, because it hurt my arm too much to swing it. I finally begged some ibuprofen from Alisha, and after a short break, it felt good as new. 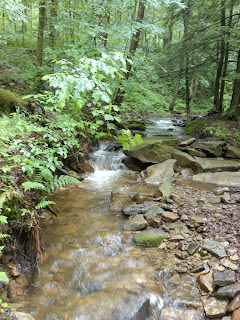 So many stream crossings - the water actually refreshed my feet most of the time, so I tromped right through. My feet were also holding up well. I really didn't try to avoid wet spots - I walked through them. The mud was gritty, but it cooled my feet, and when we came to a stream in the late morning, we took about 10 minutes to again refill water and rinse out our shoes. But our little group had a problem. There were four of us sticking together, Alisha, Kim, myself and Rob. 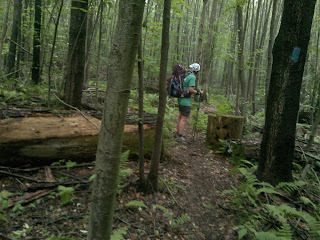 Both Kim and myself were slow on the uphills, and we were losing time. 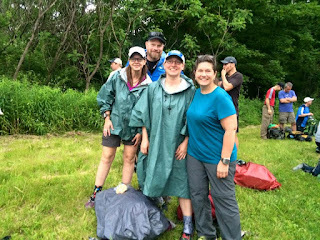 The four of us in our group discussed it, and we decided 50 miles would be enough of a challenge for us this year, with all the mud and rain. We would contact Alisha's husband when we found signal. So with the decision made, the stress of time taken off of us, we were able to enjoy the adventure a little more. Swedish fish - a endurance sport must for me. A particularly beautiful foot care stopping place. We came to route 321, and decided to have a lunch break on the bridge at Red Bridge. Also it was an area with pretty good cell phone service, so both Alisha and Kim called their other halves and told them the updated plan. 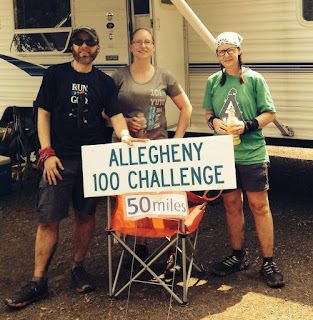 Alisha told Rich we were going to go to the 50 mile mark (Henry's Mills), and that we would contact him when we had a better idea when we would be getting there on Sunday. 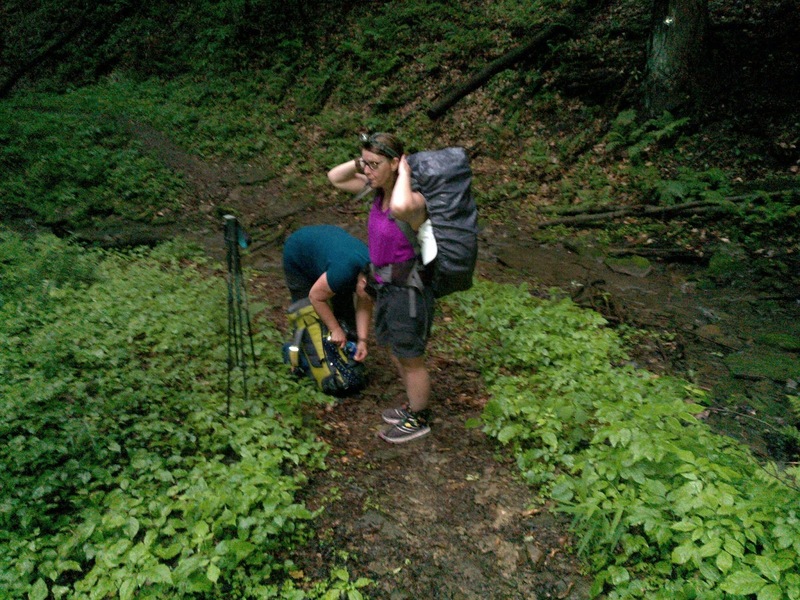 I think Kim told her Rob the same thing, but he said he could come get her right then, and she decided she would stop at Red Bridge, getting about 30 miles in for two days of hiking. Alisha and Rob G. and I finished our lunch with her, and then we all hiked down the road together, the three of us splitting from Kim when we reached the trail again. She was going to walk a little further to a store to wait for her Rob to pick her up. 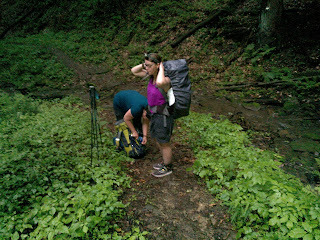 We gave hugs, instructions on gear (she was going to move stuff around for us), and we kept on going. Our Red Bridge lunch spot. Two other guys who were doing the challenge entertained us while we ate. So we realized as we continued, that Kim had been smart, because the next hill was probably the hardest and steepest we had tackled yet. 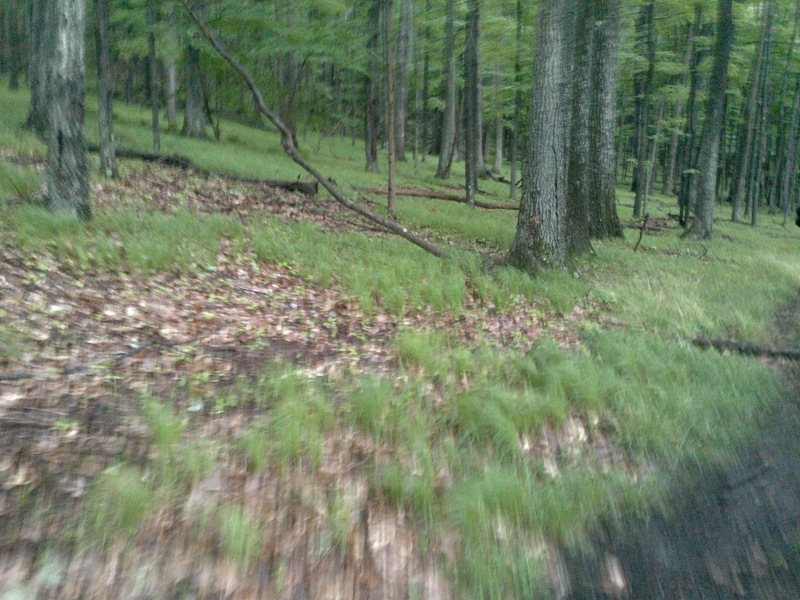 The damn hill had us climbing about 500 feet in a little under a mile. 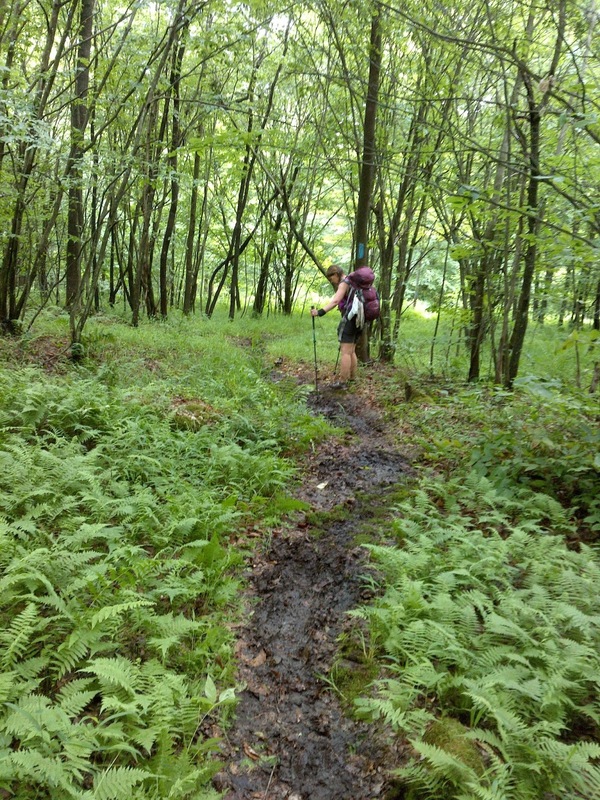 The nice thing though, the worst of the mud seemed to be behind us. Oh it was still plenty squishy, and areas of mud and yuck, but not the canted slick stuff that we couldn't seem to get a footing on. Alisha waiting patiently for me to take pictures. Rob waiting for Alisha and I to take care of our feet. 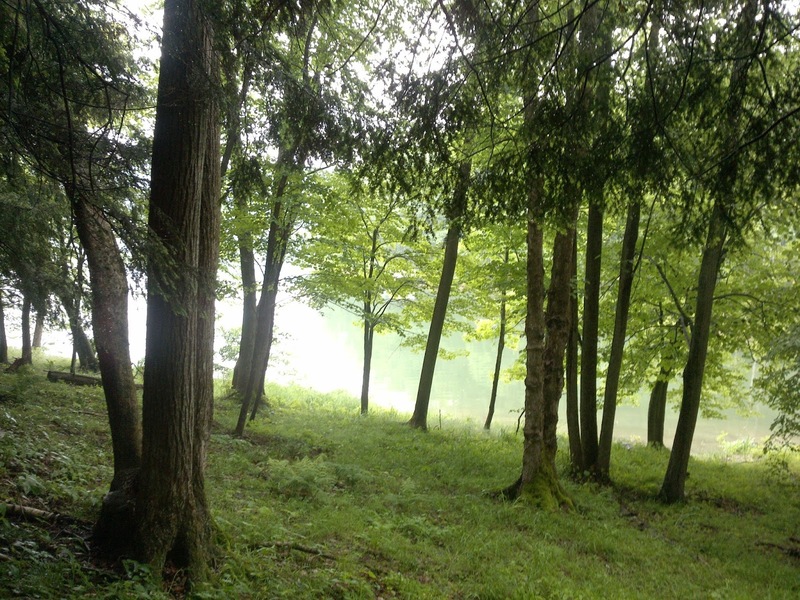 There were a lot of beautiful areas at the tail end of our Saturday hike. 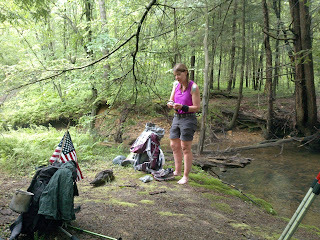 We crossed route 6 to find a nice little area by a stream to take a break and take care of our feet. 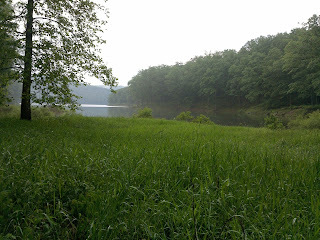 We decided to hike to Fox's Dam, which had a few primitive camp site areas, and stop there for the night. When we got there, it was still light, about 6:30, so we made a hot dinner (crap in a bag - it was so yummy), we washed up in the creek running by our campsite, and we set up the tarp. It gave us enough time to sit and relax and talk, and still get a better night sleep then the night before. Alisha and I chatted a bit into the night, but I learned, that if you want to talk to someone while camping, don't camp right next to a really charming rushing stream. I also had an unreasonable panic attack during the night, because I kept thinking I heard voices or animals in the bubbling water sounds. Lesson learned. I also wondered at my own ability to keep going. Alisha and Rob were both having foot issues, and Rob needed to be home Sunday early evening to help take care of his kids. I debated continuing to the 75 mile mark alone, because I was feeling good. But I really had no desire to go on on my own. 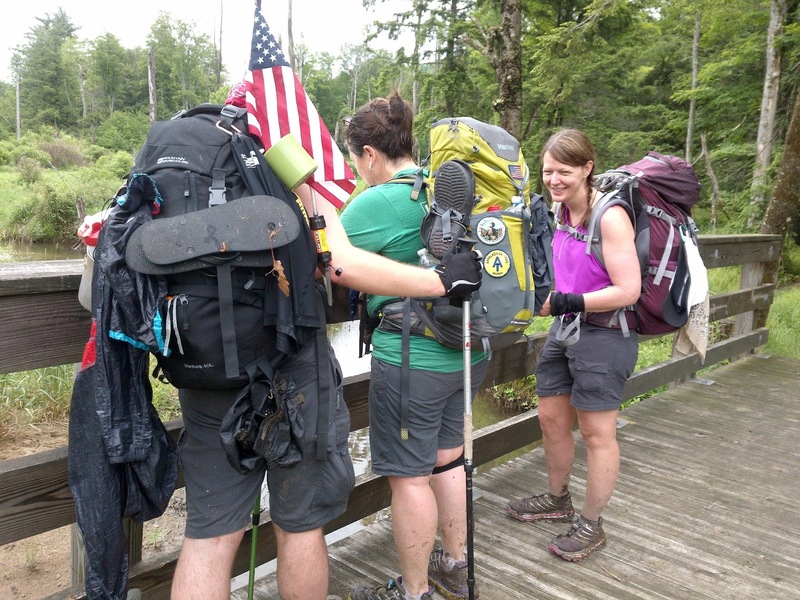 I thought maybe I could get them to drop me off at a different trailhead, and I would keep hiking on my own for a little bit. I finally fell asleep debating how much further I could go on by myself. Saturday night campsite. I'm not sure why I didn't take a picture with the actual tarp set up... but it was getting dark quickly by the time I remembered. We again woke at five, packed up and were on the trail a little after six. We needed to do about 13 miles in 5 hours. Totally doable. We set off. There's not much to say about the rest of the hike. 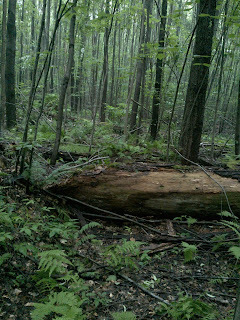 We gaped at the destruction left by a tornado still evident 30 years later in the uniform size of all the trees, and all the very large deadfall everywhere. It was a dark and quiet area. We came to some open areas through ferns where clouds of moths would rise up as we passed through. It was like something out of a movie. 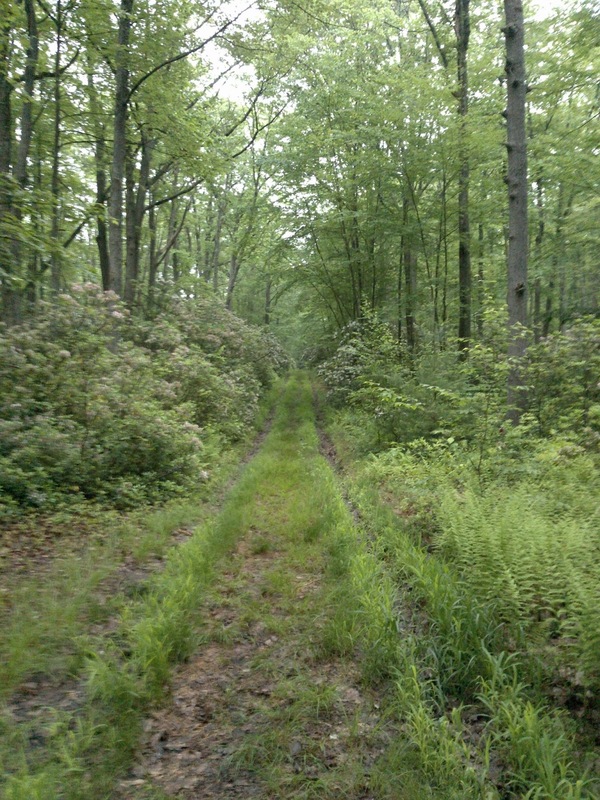 Tionesta Scenic area, where in 1985, tornadoes tore a huge swath in the forest. 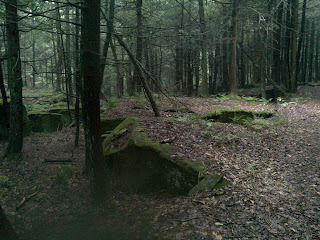 Alisha did get cell signal here, so we confirmed with Rich we would be at Henry's Mills around 11am. Alisha was a good trail guide, having done the same section in the 2014 challenge, so as we started the long descent into Henry's Mills, we knew we were getting close. Finally we heard Rich shout a greeting, and before we knew it, we were down and crossing the bridge, with a handful of people cheering us on. 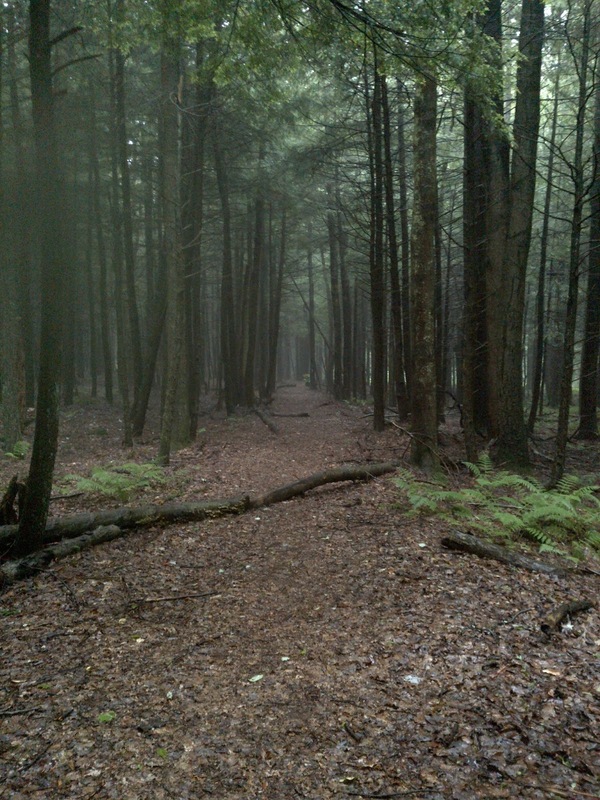 The final part of the trail down. Alisha waiting (not so patiently) for me to take pictures. BURGERS! They were making us burgers! Rich had brought Alisha a diet coke, and me a Dr. Pepper, and even a root beer for Rob! The burgers were the best tasting, and the sun had come out in the last couple of miles. It was a perfect finish. And I still felt good. I ached, but it wasn't exhaustion, it was just a little over-use. We chatted with a couple of the volunteers, threw our stuff in the car and gave a lift to another guy who had stopped at the 50 mile mark. 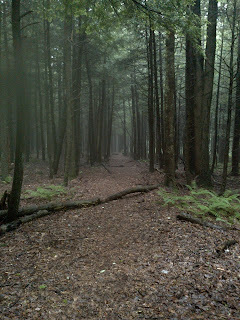 I decided I would go back to my car and dump my pack, and then determine if I would go out for a few more miles, or if I would drive home and enjoy a shower to get rid of my stench. So I got back to my car, drank another Dr. Pepper, ate a candy bar, sat and enjoyed the AC for a little bit. It had turned muggy and oppressive. I got my trail map out, and took a look at where I was, and where I could go. 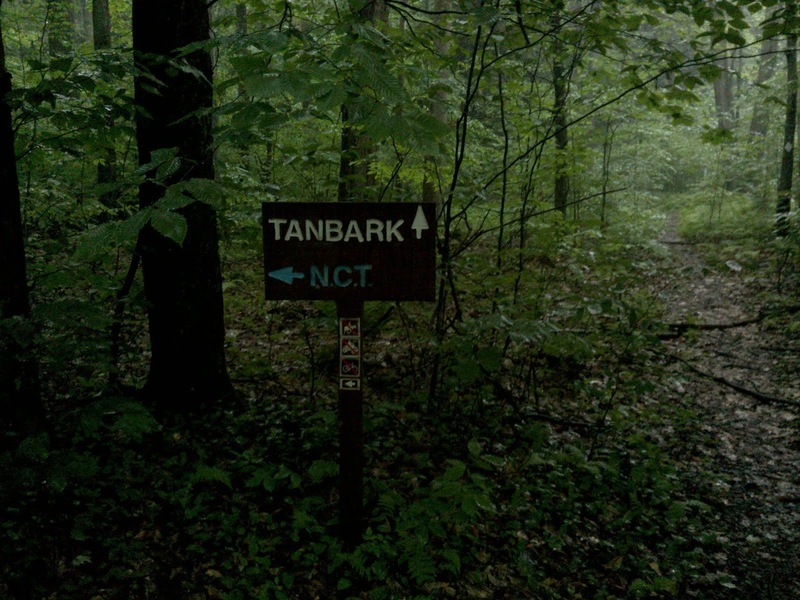 I was parked right on the North Country Trail. 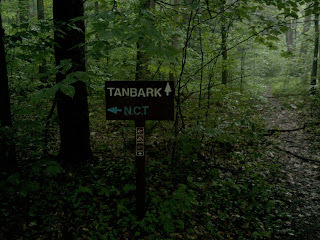 And I could just hike or jog a direction down that way, but I started the car and drove up to another trail intersection, where the North Country trail intersects with the Tanbark trail. 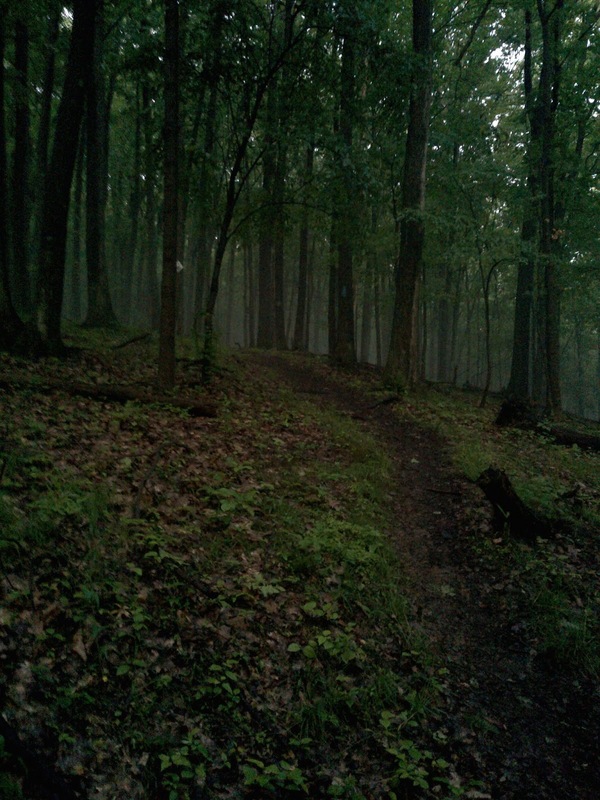 I pulled up to the trailhead and got out of the car, and it immediately got dark and started pouring. I climbed back into the car, and in a few minutes the shower had passed. Then I realized I was a filthy mess and it wouldn't matter if I got rained on, so off I went. 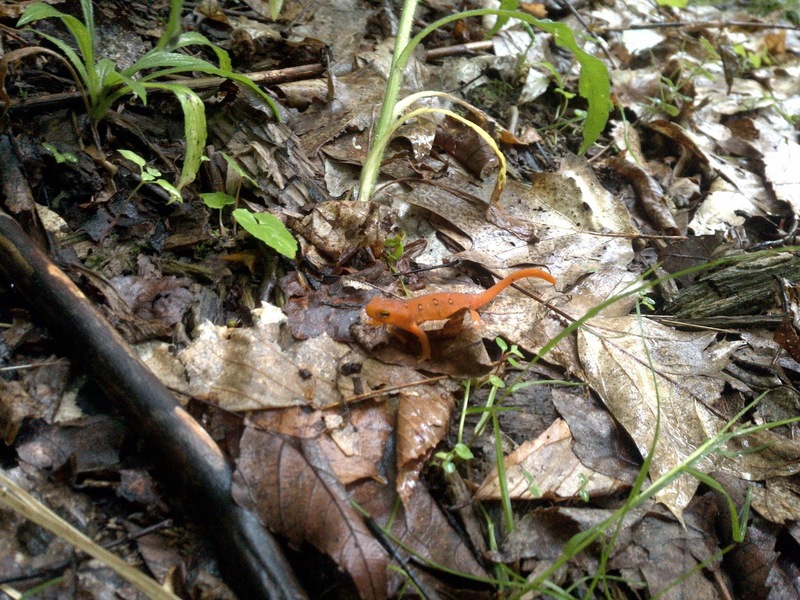 This little guy was right by the trailhead. He was a lot faster than his Oil Creek cousins. The rain had pretty much stopped as I got going - crossed this road to get to the trail. I started out walking, but my legs and feet felt pretty good, so I started a nice easy run. 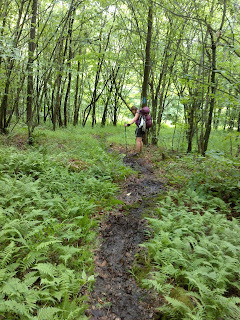 The trail was pretty flat in this area, and muddy, but I splashed and ran and jumped and felt really great. My plan was to hike/run out 2.5 miles, then head back to the car, to try to get an extra 5 miles in, then clean up and go home. 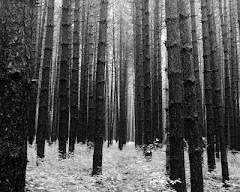 Really beautiful section of pine woods in here. Now, everything would have gone fine, but suddenly it was getting darker. And rumbly. And then more rumbly. 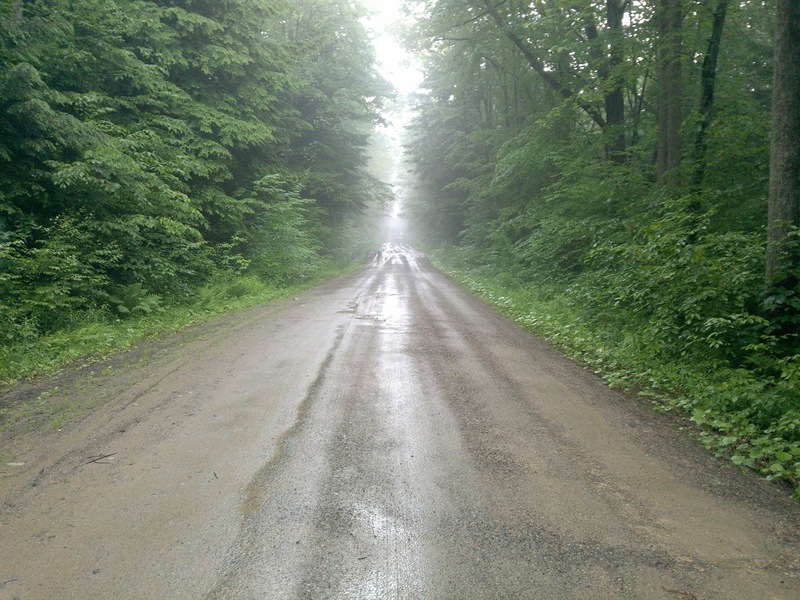 I kept running at first, and then it started raining. Then it was teeming down and the thunder was LOUD. I looked down at my gps - 1.6 miles. Big boom of thunder. That's plenty, I thought, and turned around. Now it was dark and pouring and I was soaked, and worried that I had driven off to hike somewhere else, and I would be struck by lightning and killed and no one would every find me so I ran and ran and ran and then hiked and then ran more, and there was my car, finally, three miles later, and I was happy to be back at the car. I'm really ok doing stuff by myself most of the time. But when I'm alone, I'm my own worst enemy. I'm strong for people I'm with, and when I get alone, I yell at myself in my head for being stupid and wimpy. I've been working on this with myself for many years, and though I've gotten better, I'm still way too rough on myself when doing unfamiliar things in unfamiliar places. I've learned to be brave, but I haven't learned to be nice to myself about it all the time. So being in the middle of the woods, and now pretty clean with the natural shower, I pulled off my clothes, dried off with an handkerchief, put nice clean dry clothing on, and got in the car and took a nice long drive home, back to my pups, back to my husband, back to my boy. And next year I'll do even better. Or do exactly the same. I will have a great time either way.